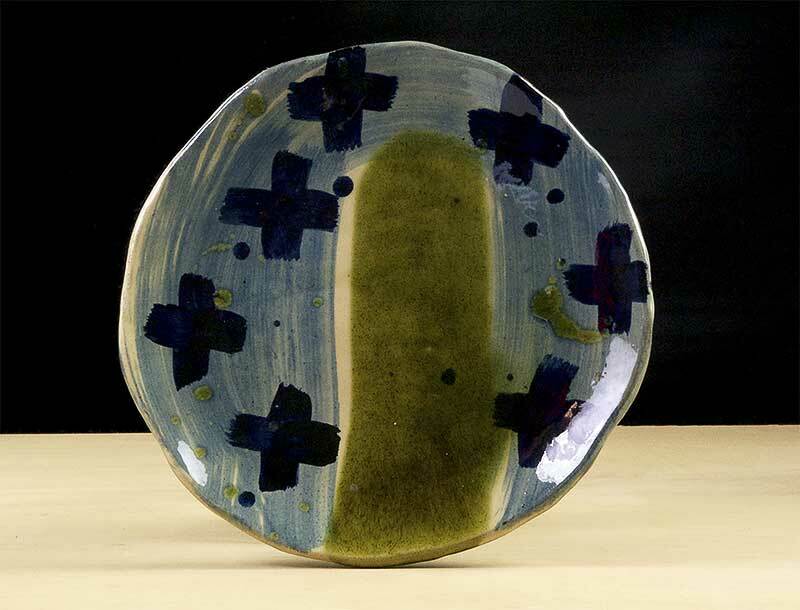 Anna Lambert makes hand built earthenware ceramics for wall and table that relate to place. 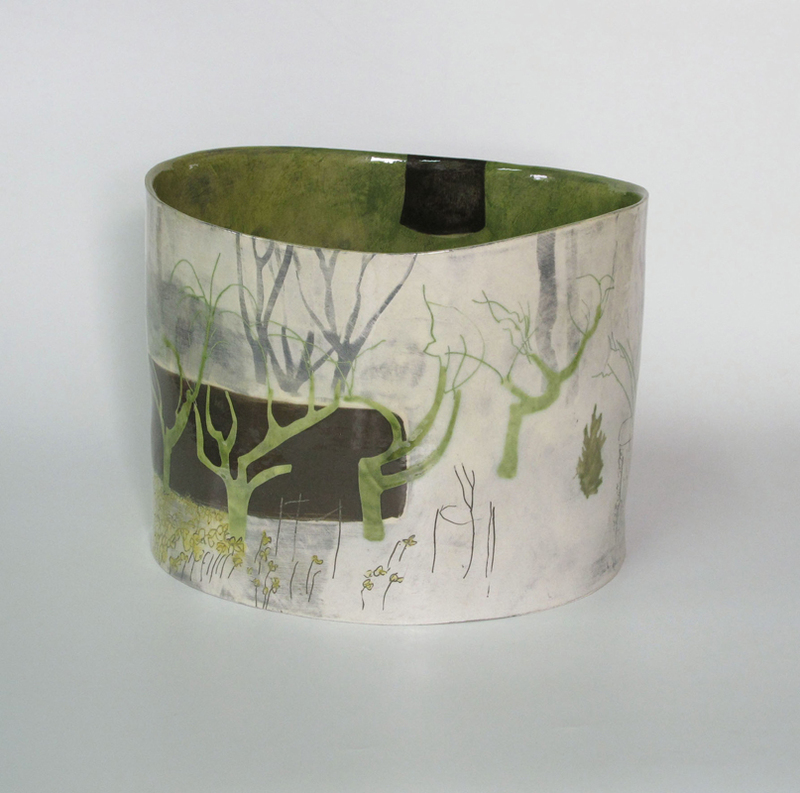 Using a range of techniques including altered clay slabs, modelling and painted slips, Anna‘s new work reflects a growing interest in her locality and to the fragile and constantly changing environment, responding to places as diverse as flooded valleys, degraded moorland and bird filled hedgerows. 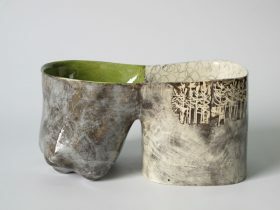 Inspired by Romanticism and new nature writing, she is engaging with a common language beyond pastoral sentimentality – interpreting memories and observation through drawing to make best use of the abstract nature of pots, their spaces, edges and surfaces, and developing a new range of techniques to alter, impress and colour the clay parts. 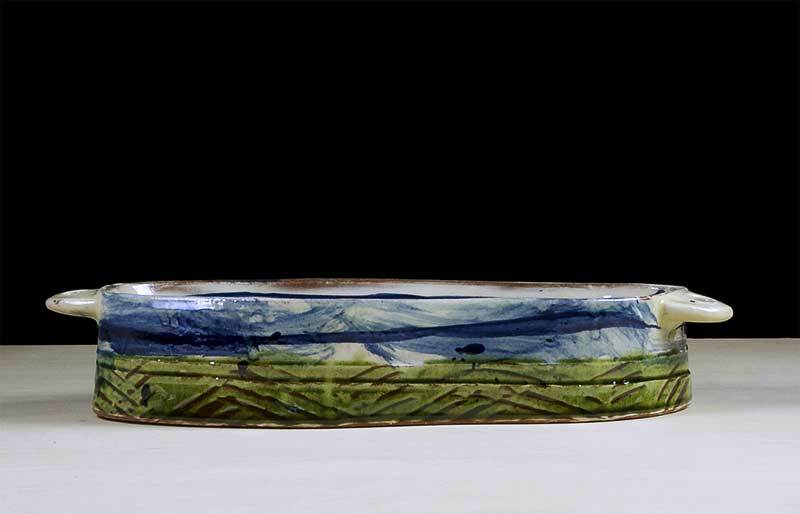 Each piece is finished with a transparent lead based glaze and fired to 1090ºC. 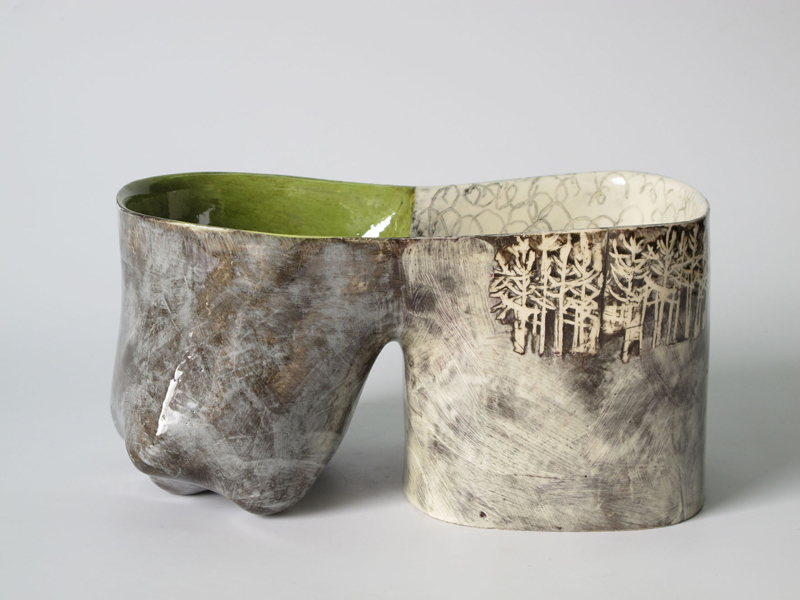 Anna studied 3D design and ceramics at Bath Academy of Art and University of Central Lancashire. 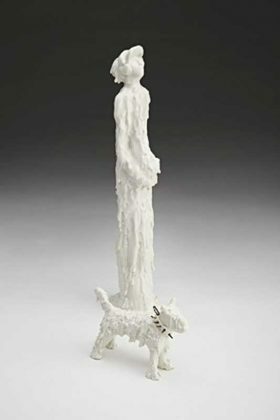 A full time maker since 1980, her many solo exhibitions include The Scottish Gallery, Edinburgh; Contemporary Ceramics, Centre, London and galleries in Europe and USA. She exhibits regularly at major ceramics fairs such as Ceramic Art London. Anna is also a part time lecturer (MA Ceramics, UcLan) and occasionally runs short courses. 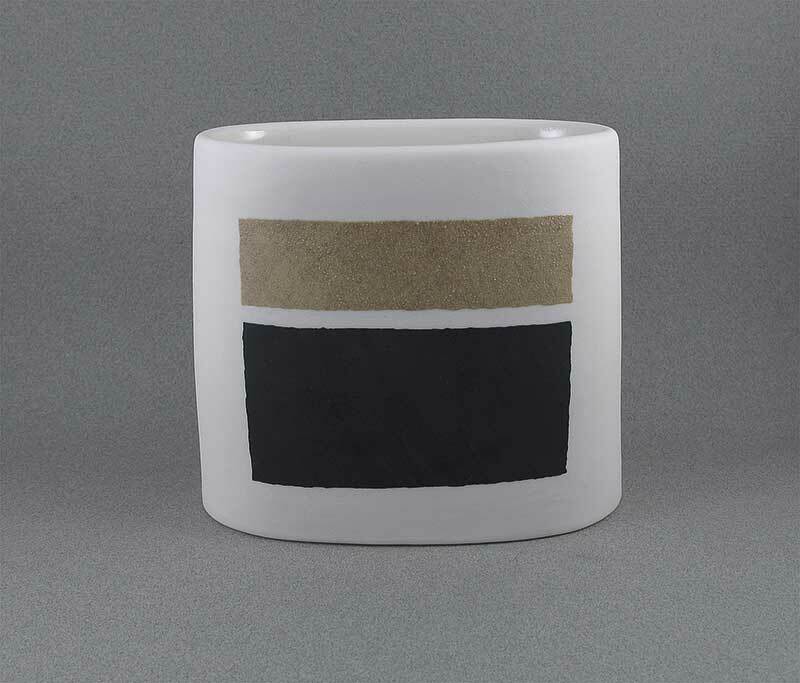 My interest in the work of abstract painters, particularly Roger Hilton , Terry Frost, Patrick Heron and other artists from the Cornish peninsula, has influenced the decorative marks I make. 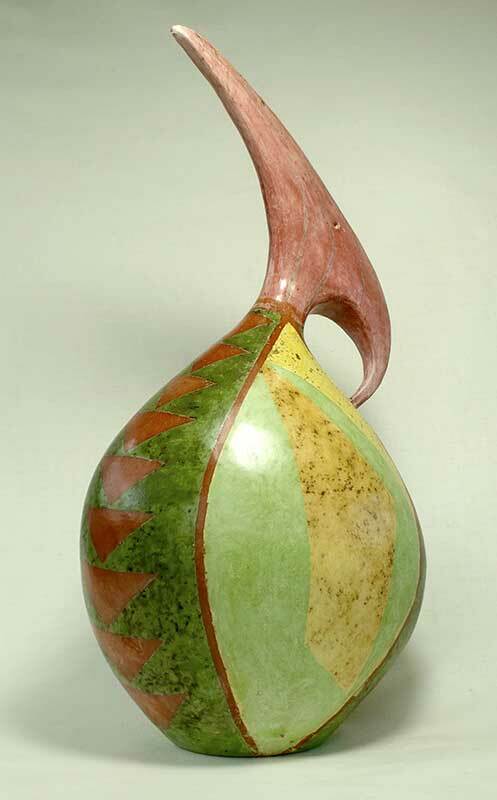 My work is approached not as a painter, but as a potter. Pots are fired in a large wood-fired kiln which is fueled with softwood off-cuts, this method of firing is labour intensive with long hours stoking the hot kiln, but the soft subtle effects it gives my work makes the pieces unique. 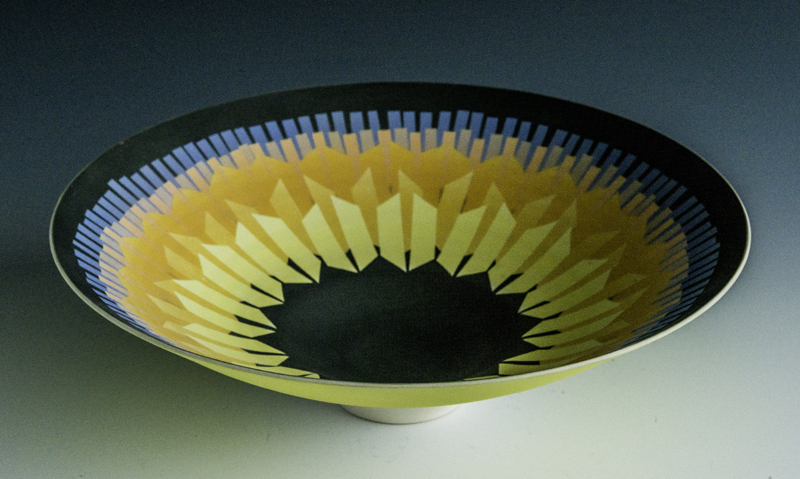 I have been a Member of the CPA (since 1960); am an elected Member of The International Academy of Ceramics; an Honorary Fellow of The Society of Designer-Craftsmen; and a Member of The Devon Guild of Craftsmen. Porcelain, with its fine texture, purity and whiteness, allows me to explore relationships between form and surface in a way that is more rewarding than with any other clay. 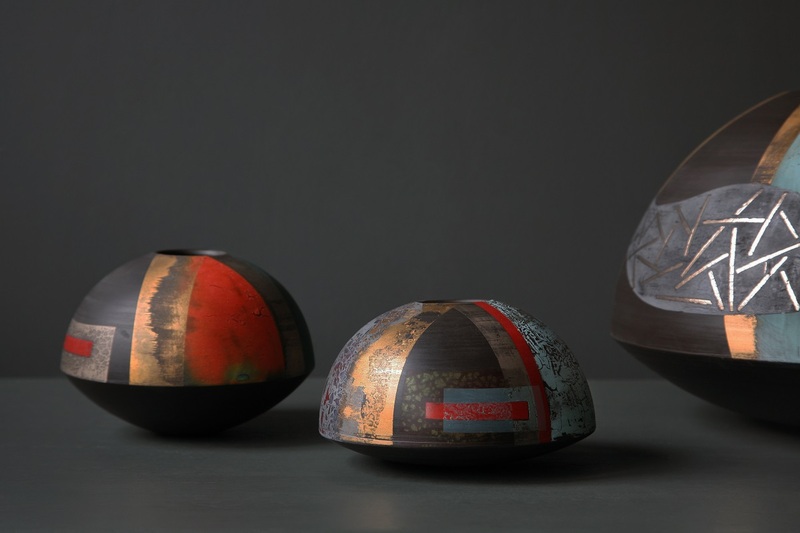 Wheel-thrown vessel forms offer infinite opportunities for subtle variations, but my particular concern, while attempting to achieve harmony and balance in the work, is to express my feelings for the natural world through the positive radiation of light and colour. Skies, sea and landscapes, together with the multitude of flora, are a constant source of wonder, inspiration and delight to me. Mountains, especially, have fascinated me since first introduced to the English Lake District as a student at Bath Academy of Art i in the mid-1950s. My work draws on various sources and cultures, and I am always evolving my own original vision which is a juxtaposition of controlled, linear designs with areas of loose, painterly decoration. 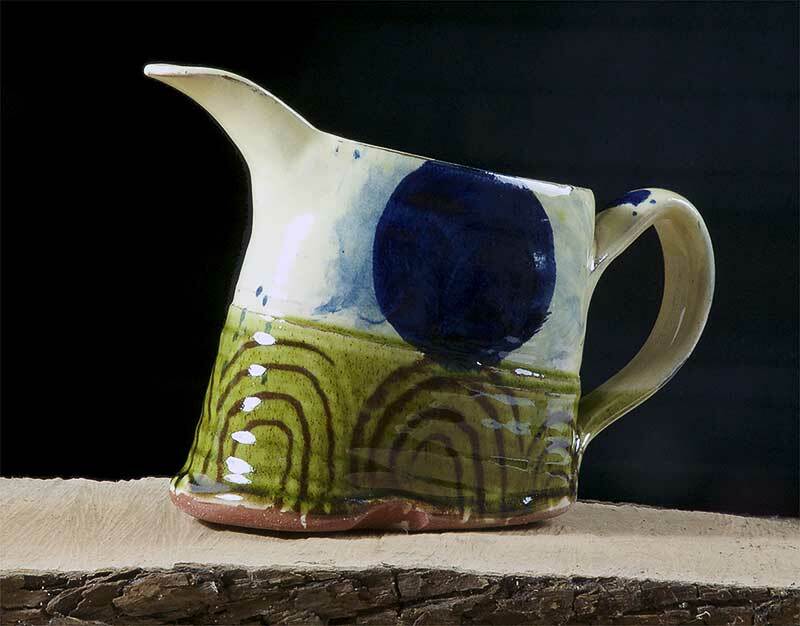 I enjoy contrasting the smoothness of the porcelain with the textural qualities of the glazes I have developed over years of experimentation. 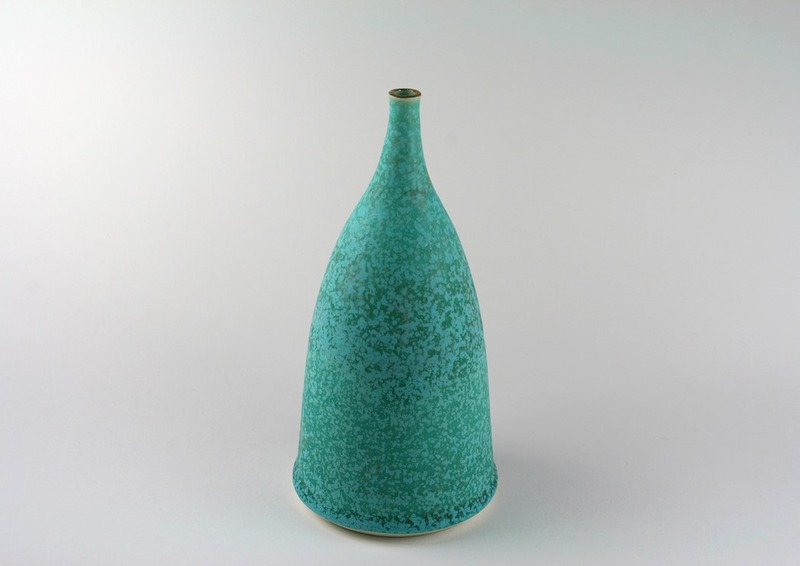 Liz Lawrence has been a Professional Member of the Craft Potters Association, a Member of the Devon Guild of Craftsmen and a Member of the Makers Guild in Wales since shortly after graduating, with her BA in Ceramics, from University of the West of England in July 2000. 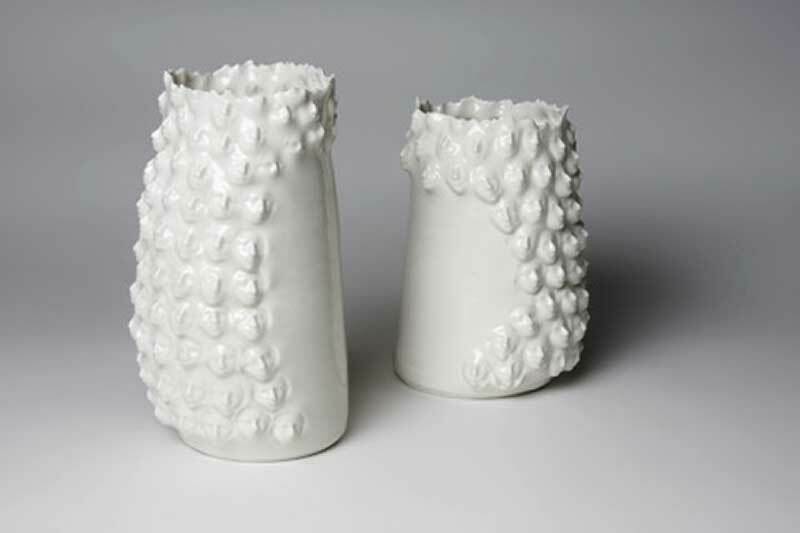 Liz enjoys working with porcelain, relishing this material’s complex but rewarding challenges. 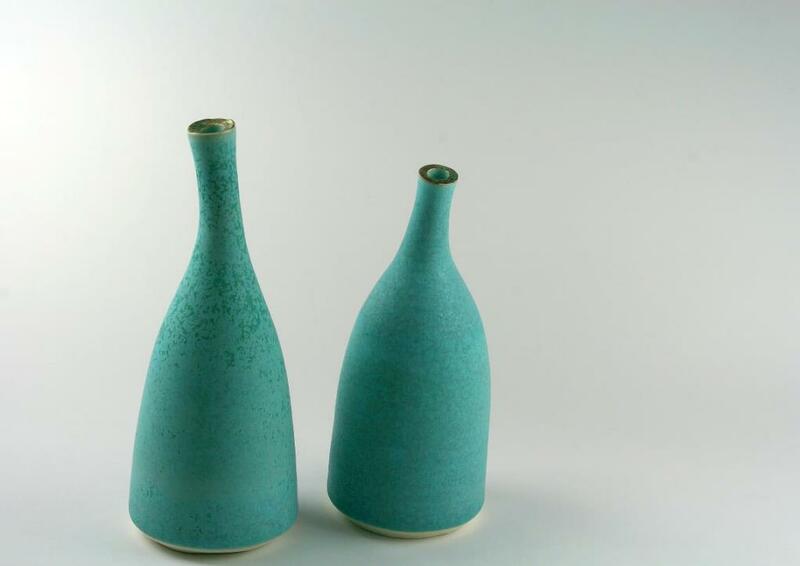 Using simple shapes Liz seeks to produce work that will create a lasting impression. 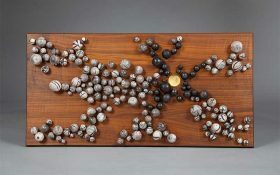 The pieces are refined but retain some evidence of being handmade; this establishes a personal note - a more intimate connection. 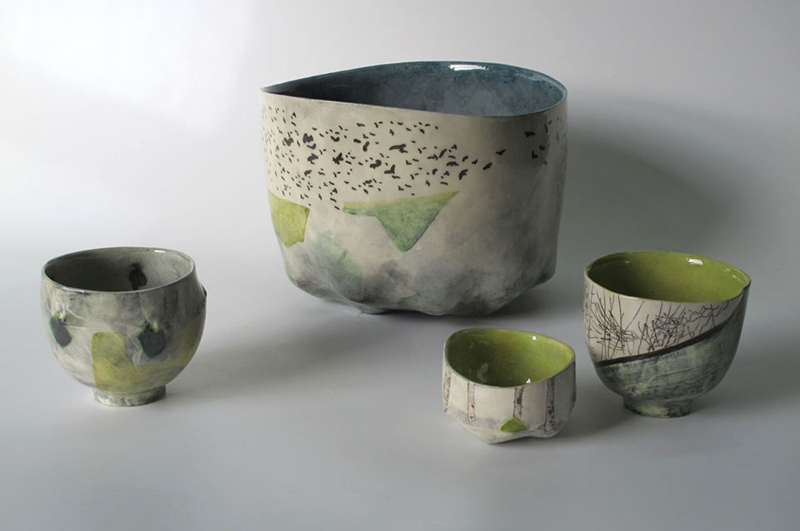 The feel of a finished piece is important to Liz, she loves contrasts like silk against linen and, as with fabric, she believes that it is possible to successfully pair different ceramic surfaces together, with pleasing results. Liz is essentially an optimistic, outward looking person and can find inspiration from many visual aspects of the world around her. The work is instinctive and Liz deliberately doesn't question too deeply where a pot comes from. She is aware that, like seedlings, some pots (pieces) take much longer to germinate than others! Porcelain is Liz’s clay of choice; the work may be thrown or hand built and sometimes decorated with slips or glazes using a resist technique, often areas of the work remain unglazed. 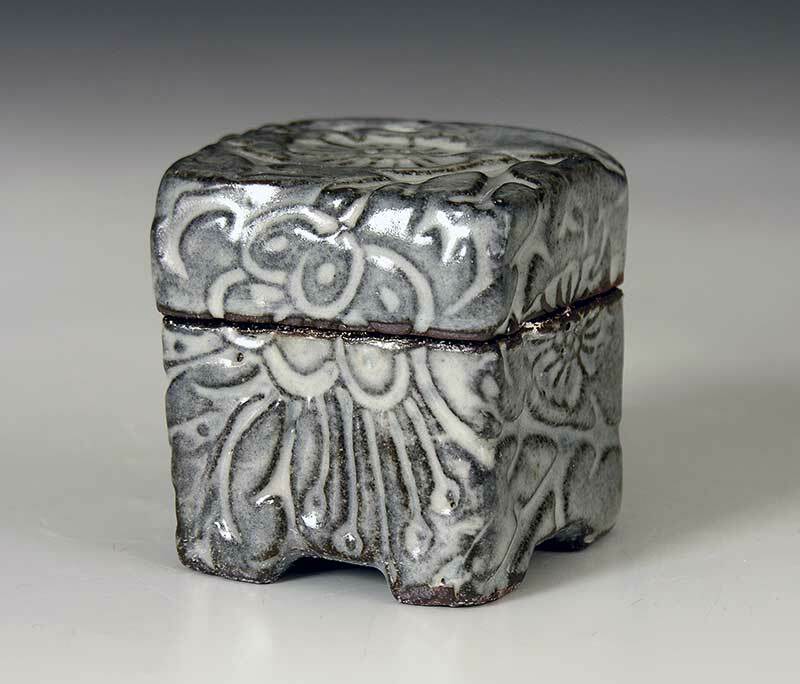 The finished pieces are raw fired (once only) to around 1260-1280 C, in an oxidized electric kiln. 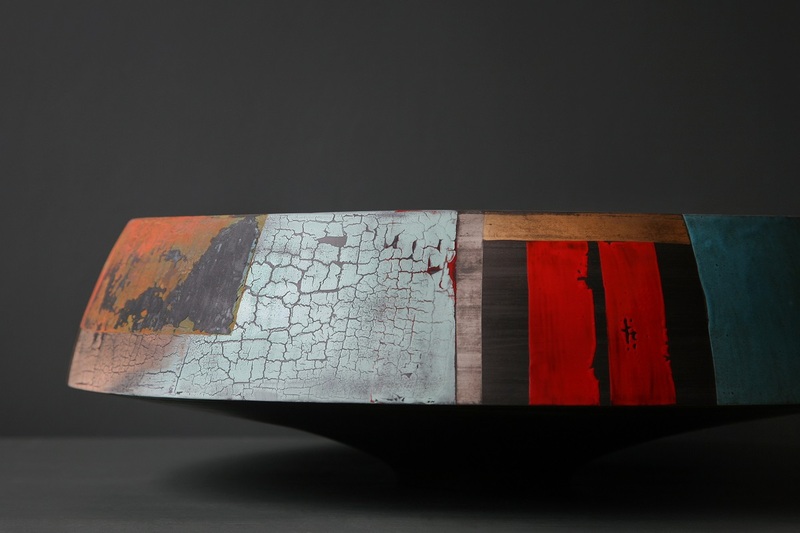 Texture, surface and form are of significant importance to my work – I attempt to develop work that brings together a number of visual influences – architecture, geology, natural form/texture and landscape. I document these influences on walks in North Wales where I live and on travels abroad. 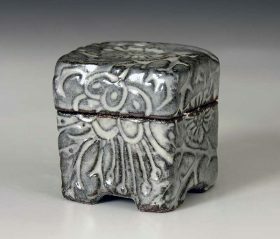 I make ceramics which are all hand built and hand carved and some very heavily textured. 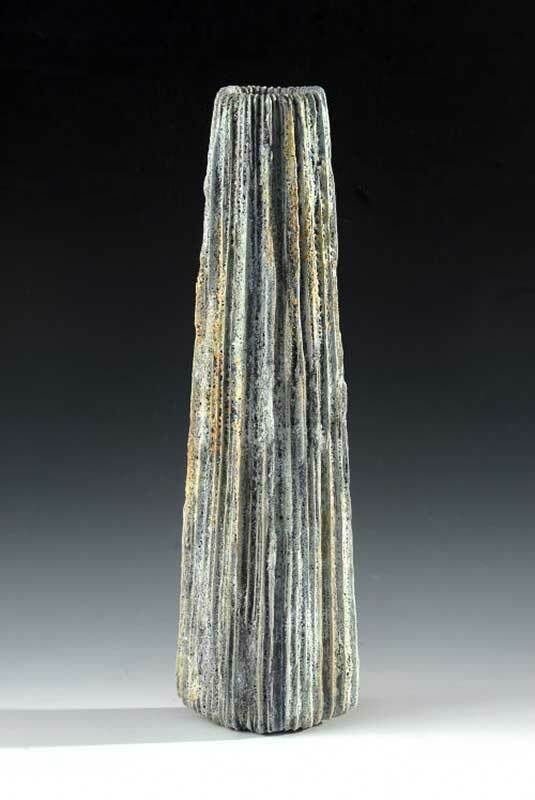 The surface is built up of multiple layers of glazes and raw materials which contain silicon carbide, a substance which produces a gas and makes the glazes bubble and blister. I fire the glazes to stoneware temperatures. 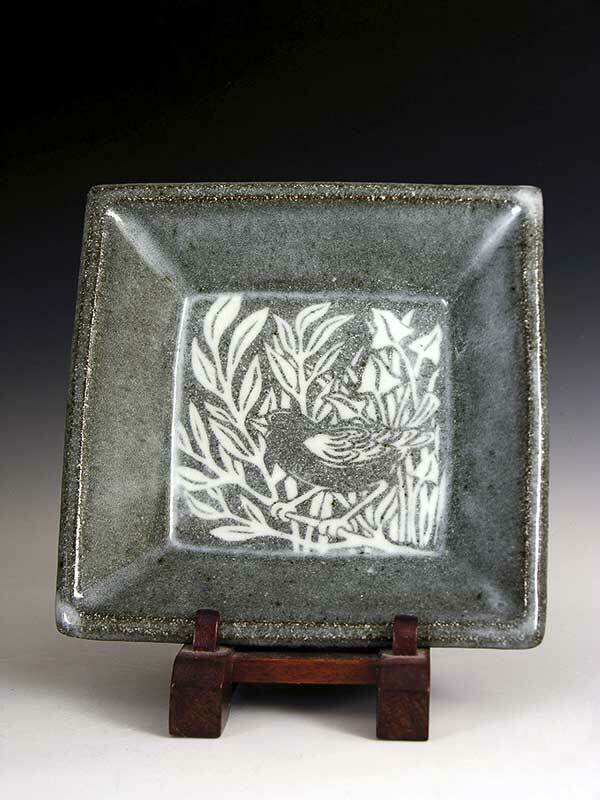 After firings I use a tool to grind back the glaze, revealing further textures within the glaze surface. My work is suitable for exterior and interior spaces. 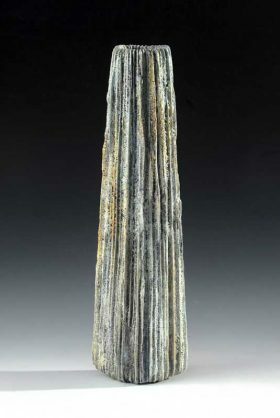 My work can be found in public and private collections nationally and internationally. All of my pots are thrown on the potter's wheel. 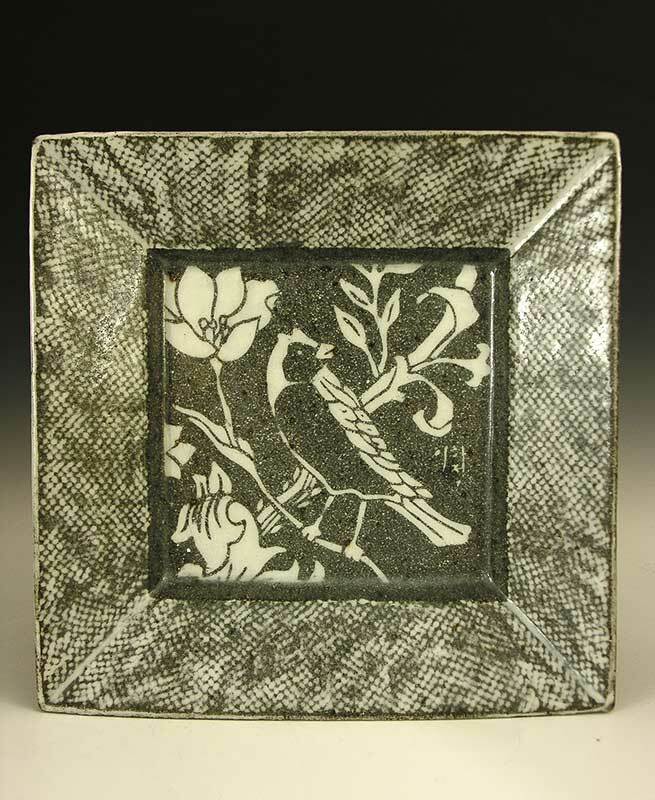 I make individual pieces using a range of stoneware clays. 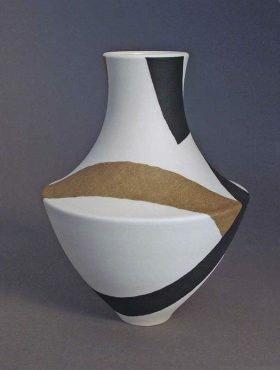 The shapes are altered while the clay is still soft, others are assembled from thrown composite pieces joined to construct taller larger pieces. 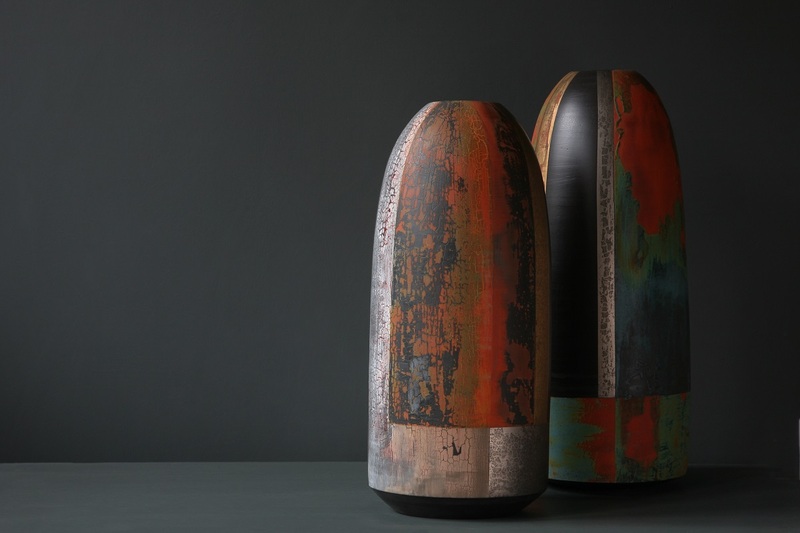 The throwing marks and the ribbed effect are intentionally left as part of the making process to enhance the fluidity and movement of the forms. 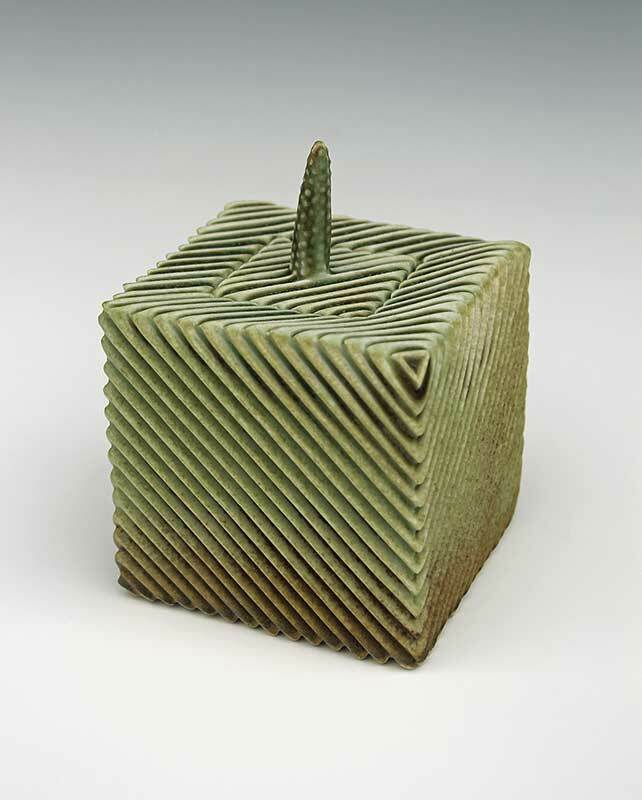 Recent exploration using textured clays that still contain many of their impurities, bring an unpredictable challenge in the making of the work and pushing the throwing of these pieces to the limits, adding a more mysterious and tactile quality to the surface of the pots. In my latest range i am producing more minimal forms, tall thin forest bottles, block platters, bowls, cups and vessels. 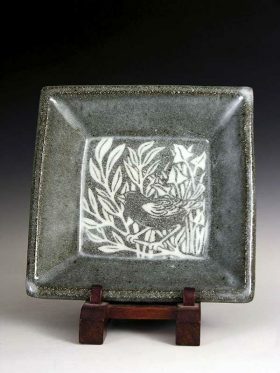 The glazes I now use are monochrome. I enjoy experimenting with high-fired glazes. I have developed a new range of coloured surfaces fired in the gas kiln to 1300 centigrade, in a reduction atmosphere. 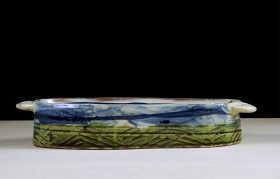 These pots are simply dipped in the liquid glaze where as my previous work involved a method of working with trailed glazes applied in a rhythmic pattern creating a fusion of colours. My new black glaze fits in every situation. 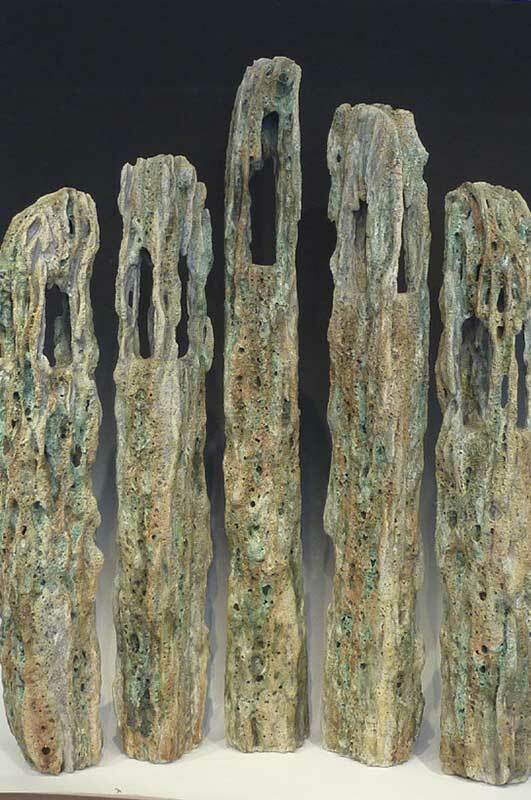 Its more subtle and dense quality absorbs the surrounding light, drawing the viewer to the work. 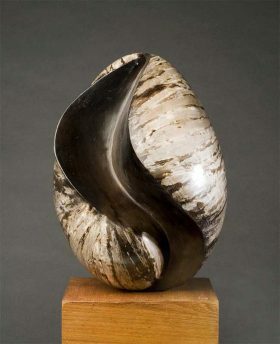 Each sculpture that I create is inspired by the natural world. 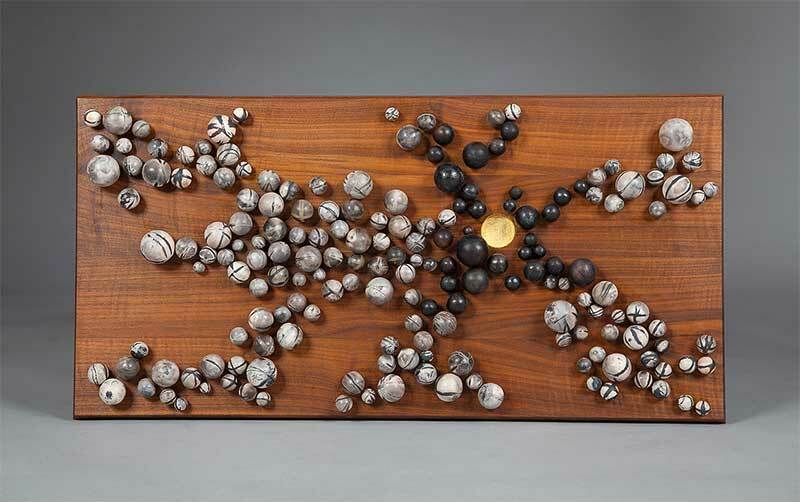 My organic, smoke fired artwork has strong forms and several facets and all are highly burnished as this results in extremely tactile shapes and allows the detail of the smoke pattern to shine through. 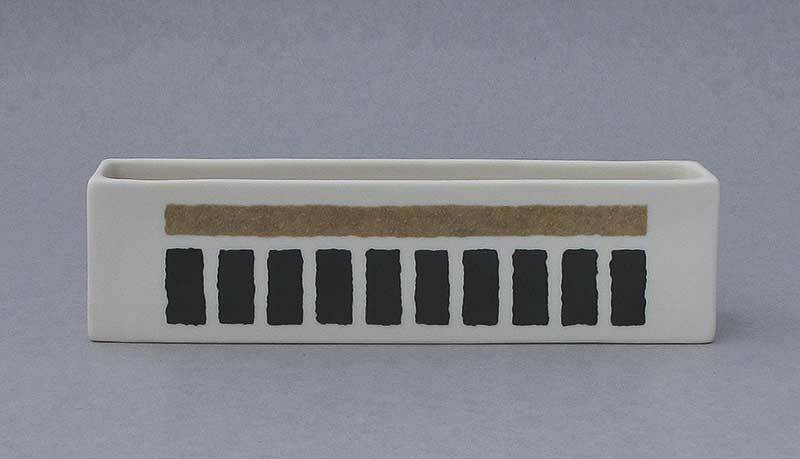 I have always been drawn to the ancient method of smoke firing and how the smoke and flames paint designs on the ceramic canvas. I have taken these ancient processes and use them in a more contemporary way to create unique effects that have depth and fluidity. 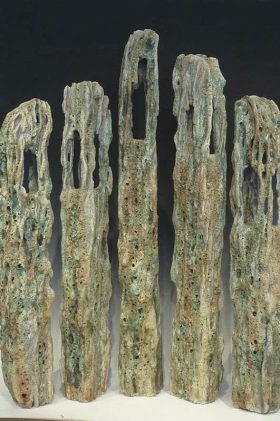 I have always purposely broken some of the wall art and dishes, either pre or post firing, and rejoined them with strong resin coated in either silver leaf or 22 carat gold leaf as this creates a beautiful vein running through the artwork. More recently, I have started breaking them and then firing them in separate metal kilns in order to have dramatically contrasting sections when rejoined. 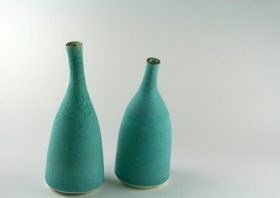 Of course a considerable amount of planning goes into the decoration design of each piece, but by using smoke firing techniques there is also a significant element left to chance. For me that sense of surprise is definitely a large a piece of art that is specific for people or places by incorporating sand from clients homes, holidays, adventures or special locations. My work is in private collections around the world, and I specialise in commissions where I can create a piece of art that is specific for people or places. Presently, I am making tableware which is a fusion of traditional Korean techniques using inlaid white slip and a dark clay and the patterns are influenced by those of William Morris. The technique is complicated. Firstly, I made a very large, flat master mould by carving the entire surface of a plaster slab 3 ft x 2 ft from which I can make plate moulds by selecting certain areas of the carved surface. Once the plate is formed it carries the imprint of the carving. 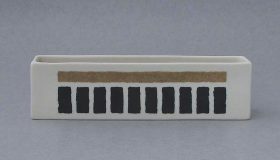 I then inlay white slip to fill the hollows and then, when dry, I scrape back the white slip to reveal the crisp and clear pattern underneath. It is both time consuming and it makes my back ache! My pots are fired in any of our three kilns but I prefer to have them in the wood kiln whenever possible. My work is fired to Cone 8 ( about 1260 degrees). I love the idea of my pots being used everyday unlike a sculpture which is entirely decorative or made to convey a message...I feel that by using my pots they become a familiar and comforting feature of a persons life. I hope you like my work and do please call by if you are in Mid Wales. 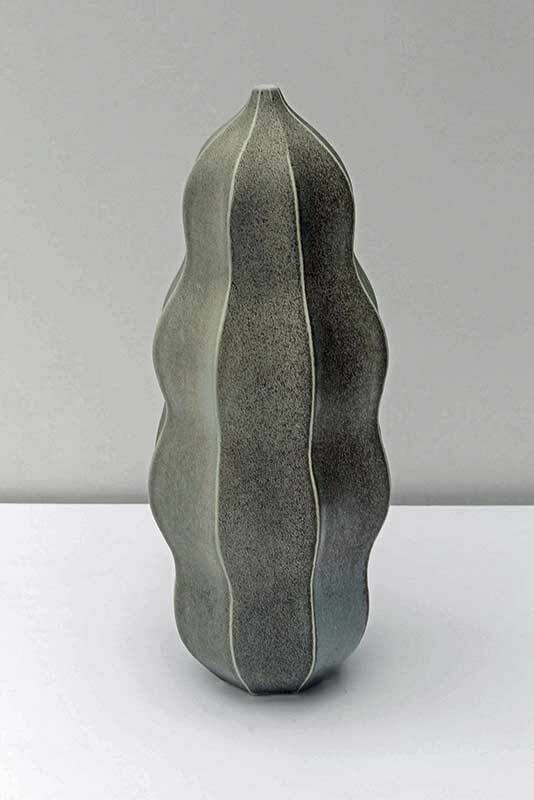 The work I produce ranges from sculptural forms to functional items such as bowls, dishes, vases, and containers. 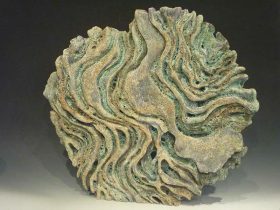 Most of my work is hand built slab work often using thin sheets of clay and is as much about how I make as what I make. 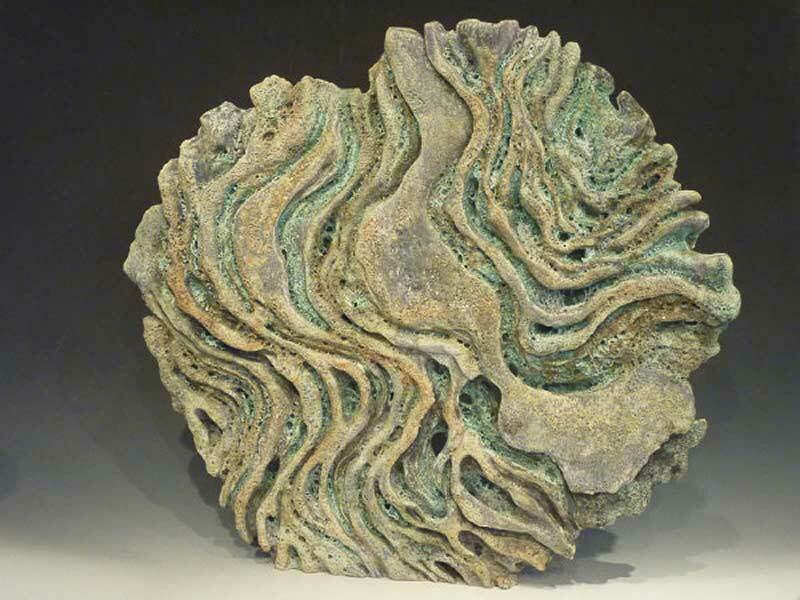 I am motivated by the physical properties of clay which is a major part of its attraction for me. 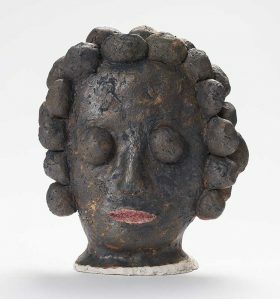 The immediacy of the material allows the marvellous combination of head and hand to work together. I like to invent, to surprise myself, to struggle to something just out of reach, and I am most excited by making discoveries that move my work forward. Working with clay for me is like a journey where you always want to see what is just round the next corner but also occasionally go back to look at something anew or check for things not noticed on the first visit. 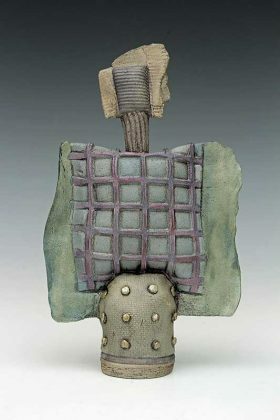 I use clay very playfully while exploring new possibilities and the immediate development from this often results in quite free work. However, I also sometimes work in a tightly controlled way as the work progresses - but I regularly need to go back to free exploration both for my own enjoyment and to stop the work stagnating. 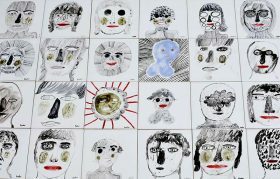 The approach I use results in my work, when seen over a long period, to be very diverse. It is, however, all connected by my particular working method and by continuous long term development - new work grows naturally out of old. 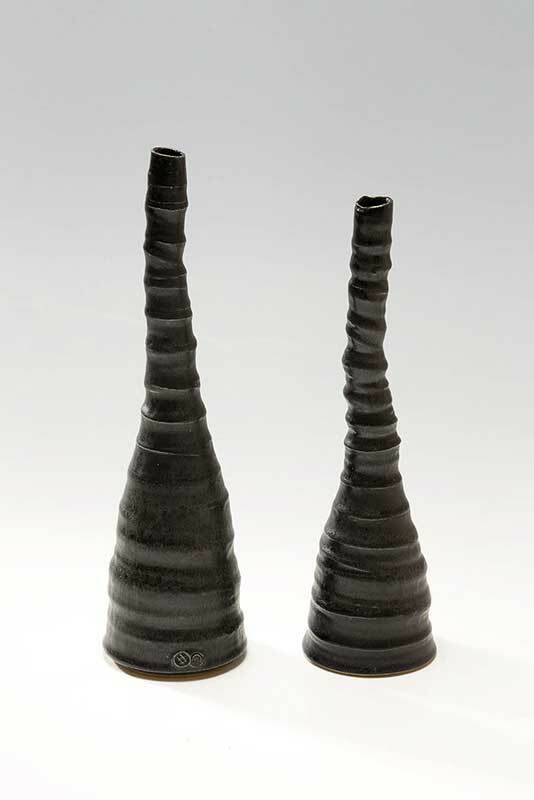 My current work is in stoneware or porcelain fired to cone 8 in an electric kiln. 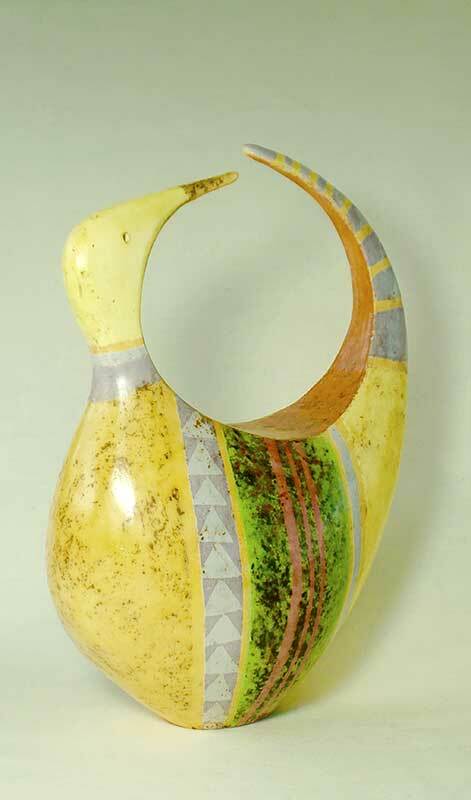 Attended Bournemouth and Poole College of are in the 1970's then worked for many years as a studio production potter. 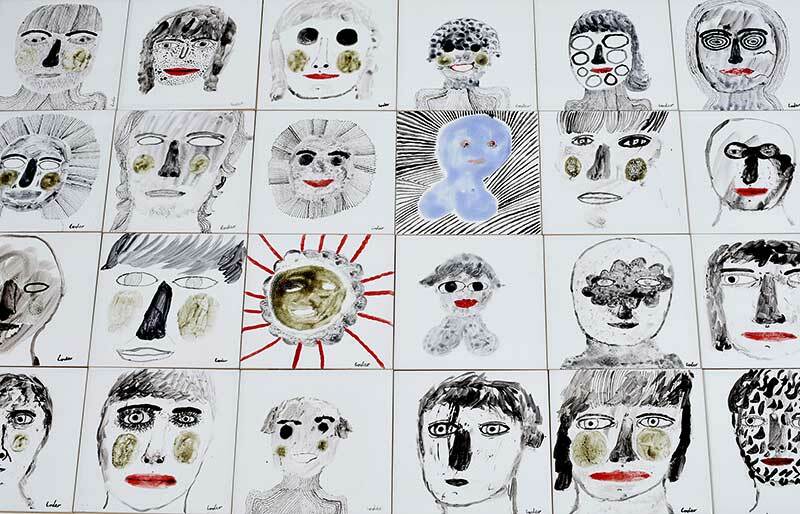 Also trained to be an Art Therapist and worked quite extensively with young adults with learning difficulties. Moved to South Wales in the 1990's and focussed on hand building. 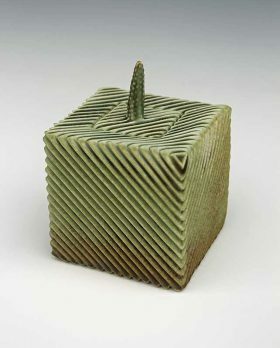 Method: All pieces are coiled using a fine raku clay. I start with either a thumb pot or a rolled out base. Once completely formed they are smoothed over and covered with oxides then slips. These are applied in multiple layers of colour. As they slowly dry out the washes bleed into each other - each layer influencing the others. Sometimes areas are masked off to give heightened contrast and pattern. 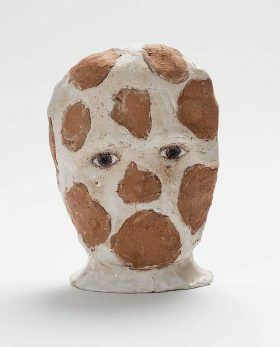 Focus: Latterly the focus has been more on sculptural forms than on pots and birds have been taken as a starting point both as form and mode of expression. 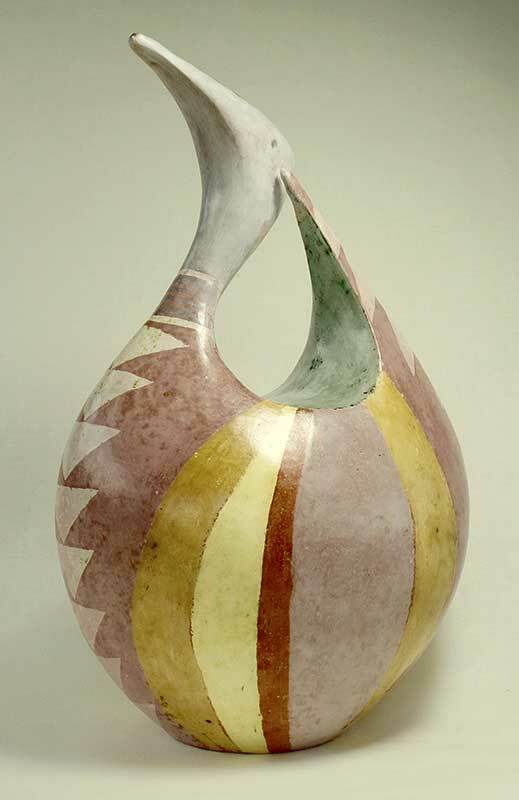 Additionally the pieces draw inspiration both from the land and seascape of South Wales and the patterns found in the native arts of North America. Narrative plays a significant role in my work: spoken and written language and the transgressive role of comedy offer up many starting points. This is my framework, around which are woven themes that come and go. Feminism has been a recurring subject for me since my BA and is currently in sharp focus as a response to the new wave of feminist debate. I am not religious, however I am intrigued by the human need to create an idealised vision of itself, in icons and ritual and much strange paraphernalia created by people to make sense of life and death. 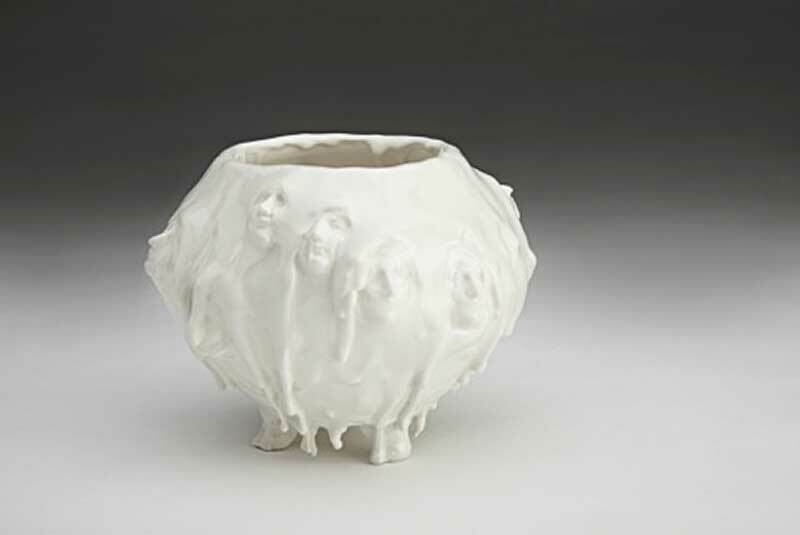 I use metaphorical evocative surfaces on the vessels to engage viewers, draw them in or at times repel. The symmetry of wheel thrown vessels is experimentally altered through the application of relief by manipulating the malleable surface with small moulds. I am also currently experimenting with new hand build shapes, such as candelabra; abstract architectural slab vessels as well as figurines. Face details taken from religious figurines have been one of my most enduring designs. The face of a saint becomes a metaphor for idealism. On some pieces layers of liquid clay are used to obscure the relief and create a sense of instability, wile the use of skulls visualises what we are most scared of. 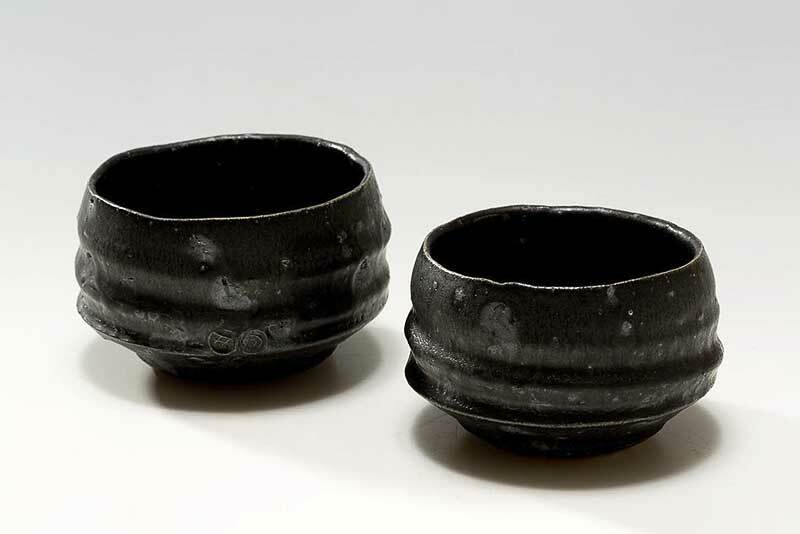 Torn rims create a sense of the incomplete unfinished, with an indication of the object being a significant artefact, a fragment of a larger form. 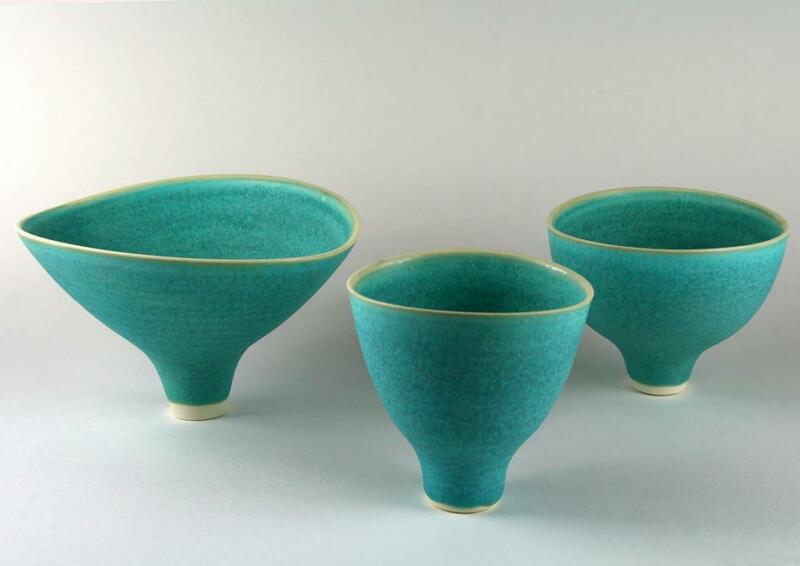 I throw and hand-build in various clays, making bowls, vases and sculptural forms. My main output is concentrated on small-scale porcelain and white stoneware bowls and vases which are exclusively hand thrown. 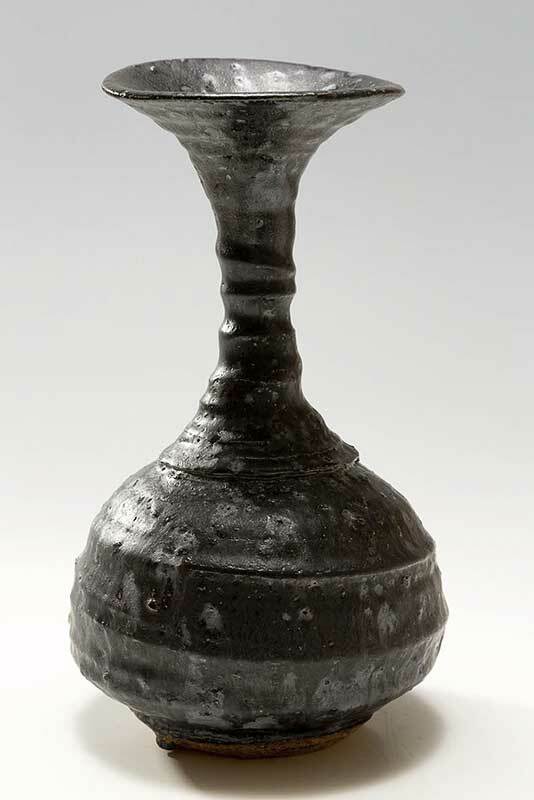 Because of the small size of these pieces, they are often thrown ‘off the hump’, which involves throwing up to nine or ten bowls from the top of a one kilogram cone of clay. After throwing and subsequent turning, l often distort the piece while it is still malleable, which increases the organic qualities of the work. l am inspired by natural form, colours and textures. l then bisque fire the pots to 1050°C, and finally glaze them in one of a range of semi-matt glazes, which l choose for their tactile and visual qualities. All the pots are then re-fired to temperatures between 1230°C and 1260°C, depending on the glaze used. After firing, pots are often further decorated with geometric shapes using gold and copper leaf as well as various lustres.